Vinden och floden (The Wind and the River),1951 by great Swedish filmmaker, Arne Sucksdorff. Based on the life of boat people of Kashmir. 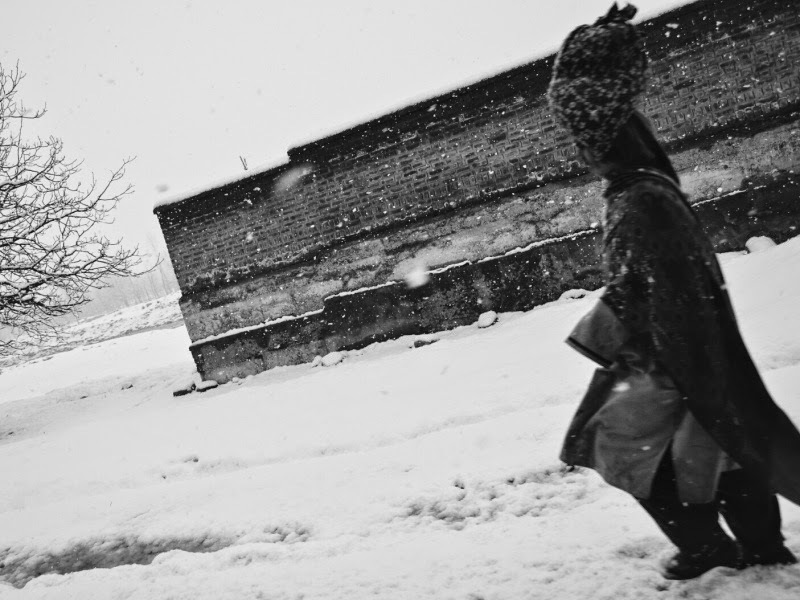 Lyrically capturing the songs and images of that life in one of the most beautiful films ever made on Kashmir. Arne Sucksdorff visited India in 1950, it seems with the objective of documenting the life of its working people. Out of this visit came two films: Village Hindou (Hindu Village) about the lack of water in an Indian village, and Vinden och floden (The Wind and the River), about river life of Kashmir. The film begins with a quote (missing in the extract above) which summarises the vision of the film, "Når de tunge pramme stages op ad Jelum-floden, sker det under en storslået dialog mellem Allah, Mennesket og Skønheden. 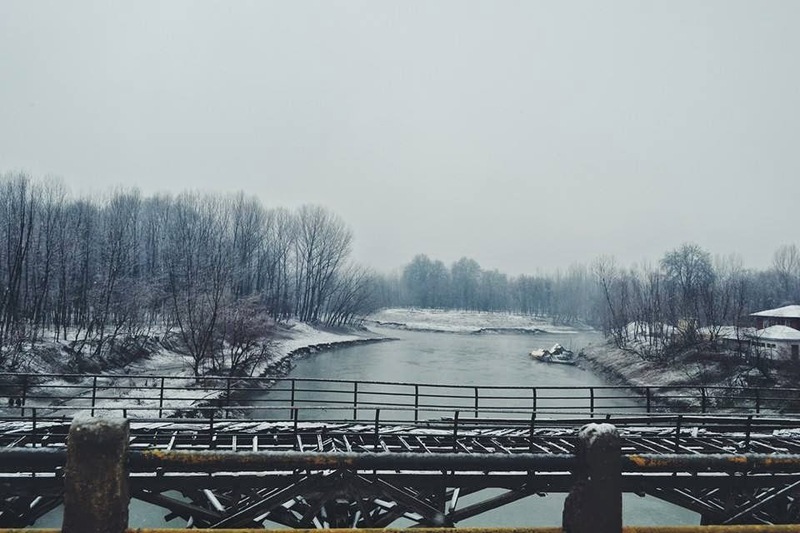 (When the heavy barges poled up the Jelum River, she does so in a magnificent dialogue between God, Man and beauty.)" The music of the film, a blend Kashmir folk and India Classical, is by Ravi Shankar, who was yet to attain international acclaim back then. 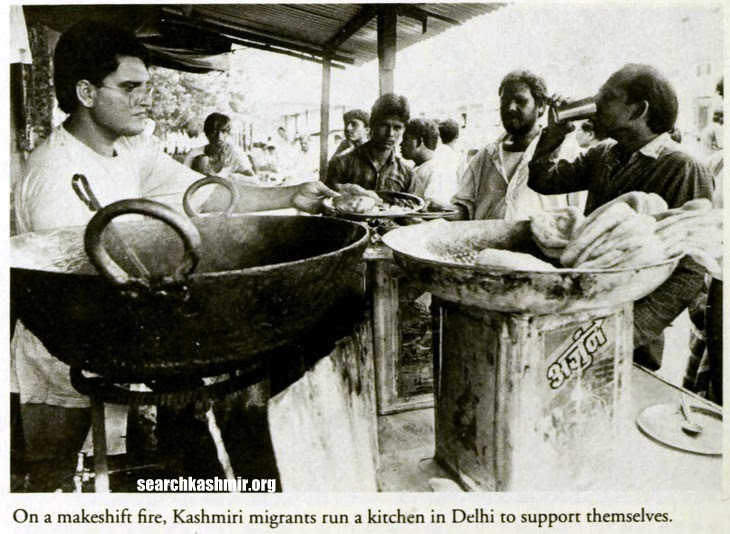 He was working with AIR at the time and probably artists form AIR station Srinagar were used for creating the sounds. 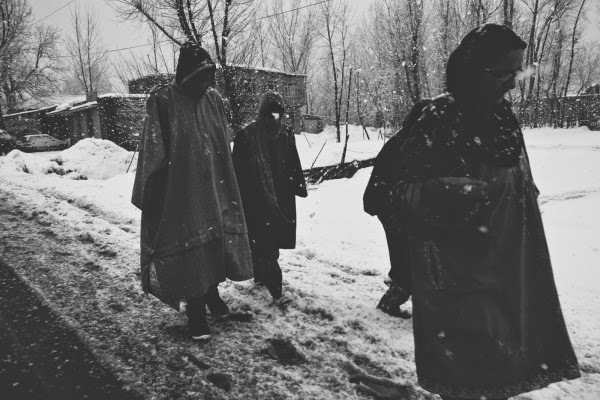 The film begins with scene of a Hindu ascetic mediating atop a hill in Srinagar. Down below, the city is brimming with scenes of lyrical songs of life. A life sustained by a river that quietly flows through it and weaving a web of ecology in which people seem to be at peace. A peace for which people thank their benevolent gods. Extracted from 'Uma Vida Dividida' (2001). 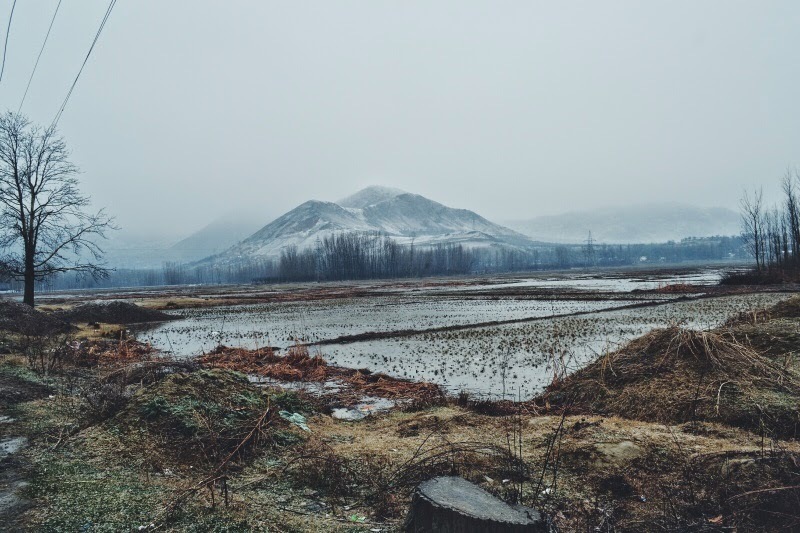 view from next to a patrol pump between Avantipur and Srinagar. 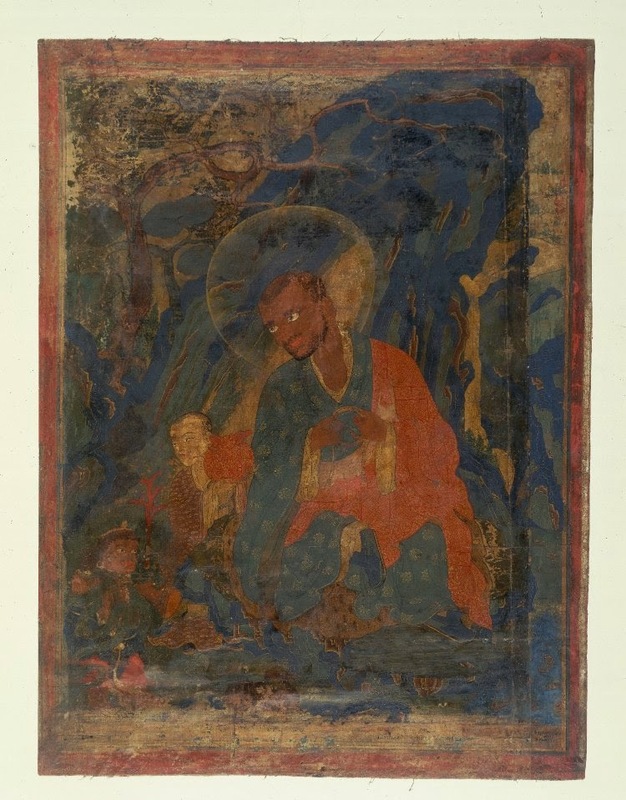 Serious Union/Gambhira Sangam= Vitasta + (Vishav + Rembyar, Stein's Gambhira). Gambhira Sangani of Rajatarangini. 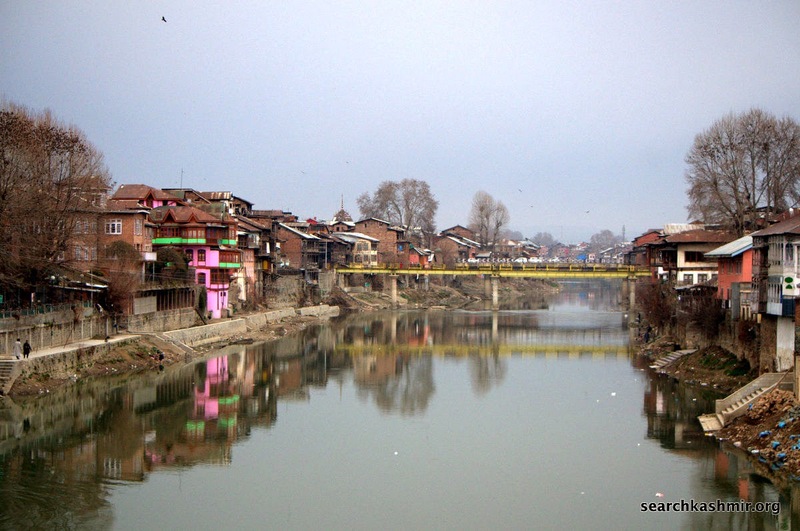 Sangam at Kakapora. 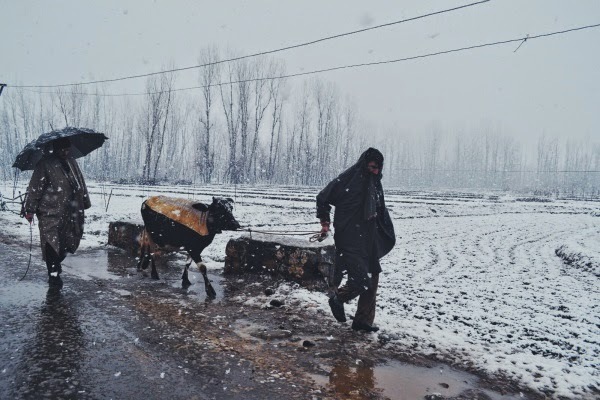 Between Bijbehara and Avantipur. 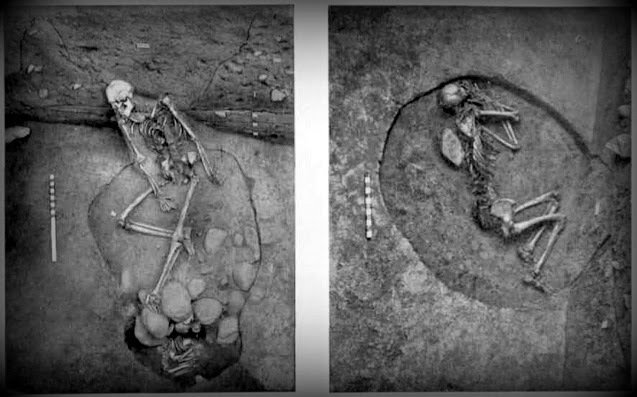 Burial pit. Burzahom. A decade long digging and study by T.N. Khazanchi that stated in early 1960s. 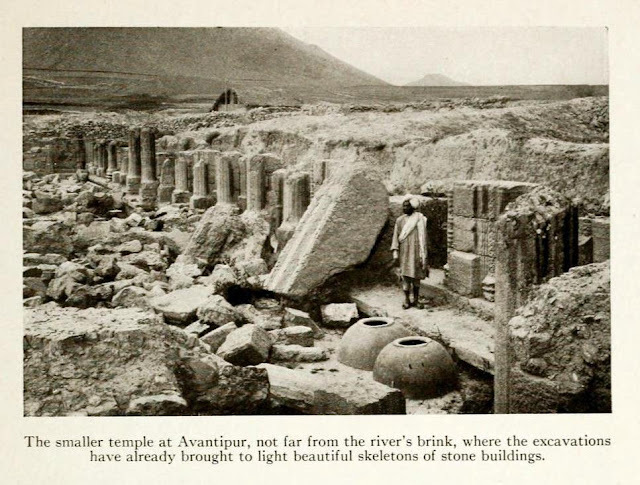 From 'Indian Archaeology - A Review, 1962-63'. A scene from early 90s. 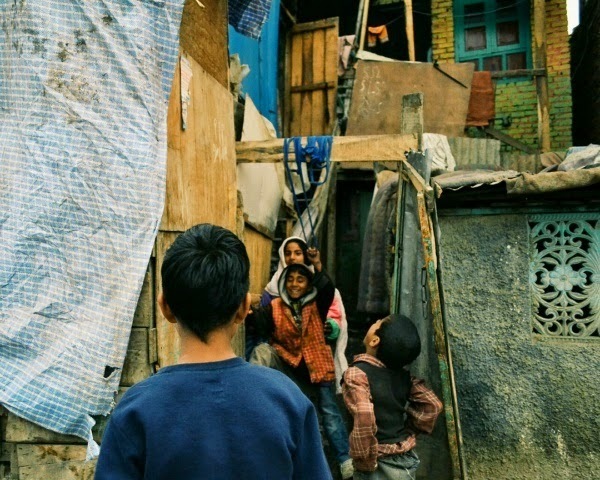 "On a makeshift fire, Kashmiri migrants run a kitchen in Delhi to support themselves." Since there in not single work in early 90s on this specific tribe, these pieces come from multiple sources. 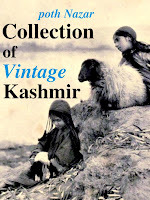 This one is from the book, "The Kashmir Tangle : Issues and Options" (1992) by Rajesh Kadian. The story of Delhi Migrants that I remember from this era involves an unnamed Pandit who became a bus conductor in Noida. The man, a misfit in the big bad city, was murdered, it was said by fellow conductors over petty professional rivalry. I waited, but no one wrote his story. 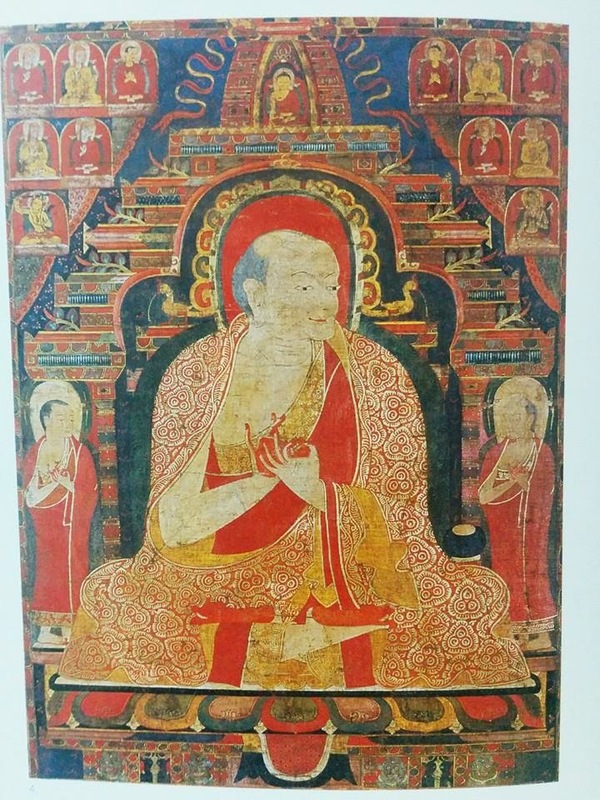 Kanakavatsa, the legendary figure from Buddhism, one among the sixteen Arahat of Indian origin from Buddha's time, is believed to have been born in Bihar and lived with his 500 Arahats on the "Saffon Hill" in Kashmir under the patronage of the local King. In the the iconography of Kanakavatsa, a barbarian King is often shown kneeling before him worshipping. 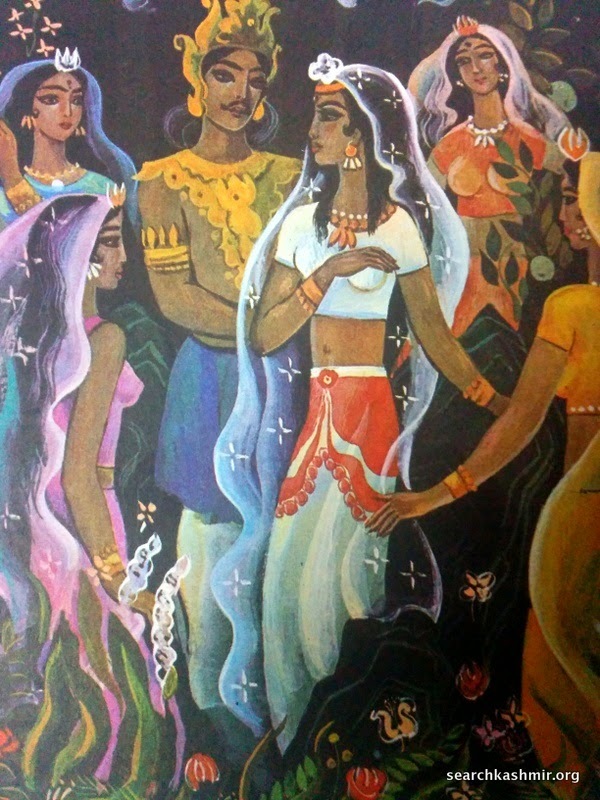 In the above image, an "an Indian adorant offers coral" while the ethnicity of Kanakavatsa by his color. 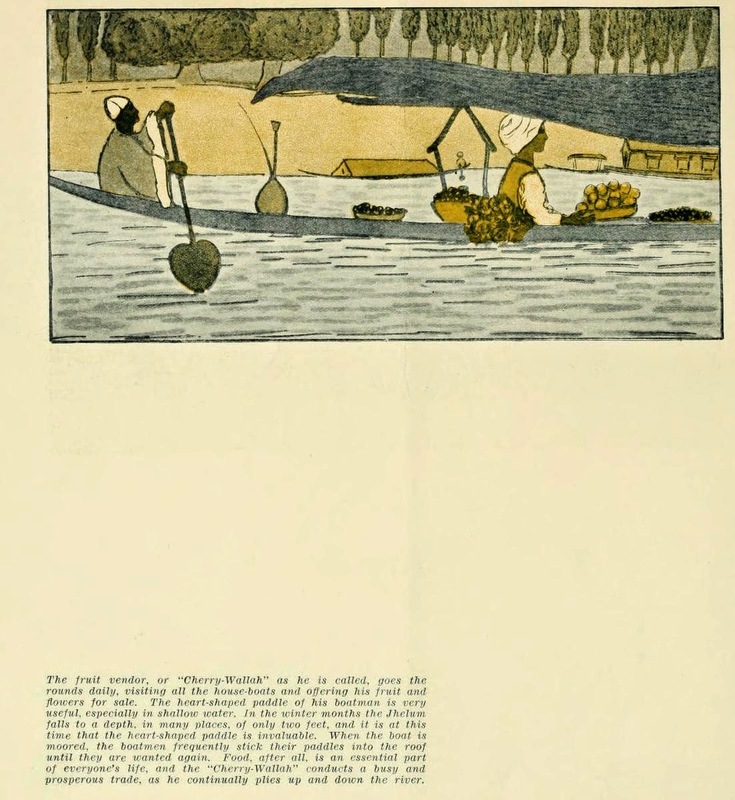 From 'Asia - Journal of the American Asiatic Association' (Volume v.18 n.04), April, 1918. 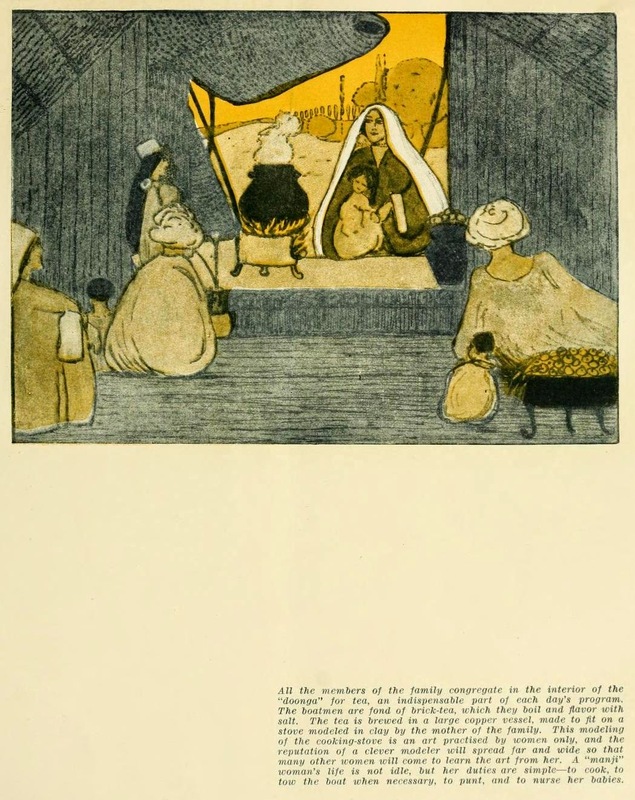 Miss Brunhilde Chesney, who was born and lived in India, offers a glimpse into the life of Hanjis. In the furnace of summer, I finally learned that within me there lay an invincible winter. 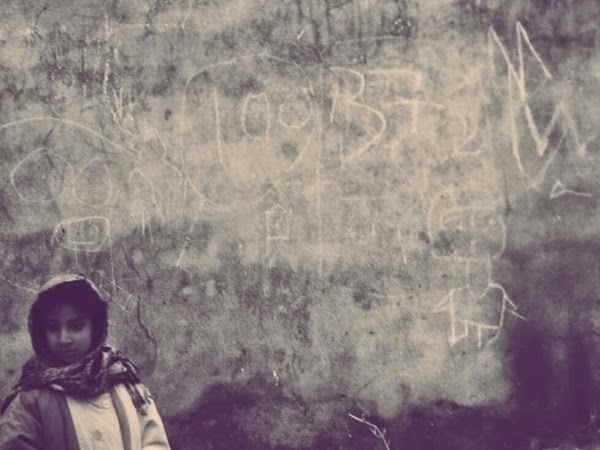 In 1955, on a diplomatic goodwill mission for USSR to Kashmir, Uzbek communist leader Sharaf Rashidov, a name that in later years would be called 'a communist despot' and a few years later would be called 'a true Uzbek hero', came across Dina Nath Nadim's opera Bombur ta Yambarzal, a modern re-telling of an inspiring old Kashmiri story. 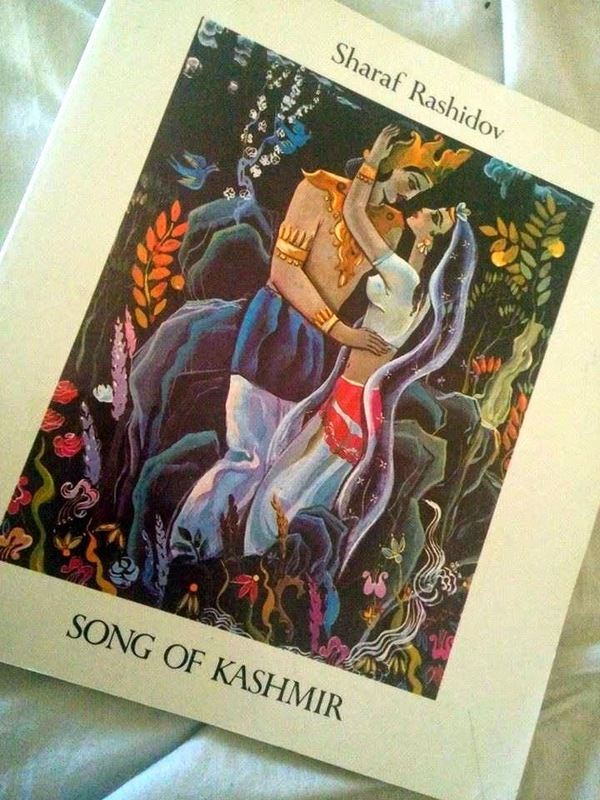 By the end of 1956, Rashidov was already out with his interpretation of the story in a novella titled 'Kashmir Qoshighi' ( also known as Song of Kashmir/Kashmir Song/Kashmirskaya song) acknowledging Nadim's work. I finally managed to get my hand on it. This is the English edition published in 1979 by Gafur Gulyam Literature and Art Publishers, Tashkent. Translation by A. Miller, I. Melenevsky. Illustrations by K. Basharov and R. Halilov. "Memory is a drawing on a rock and a picture on a canvas. Memory is line of words carved on a stone slab and a book. Memory is a fairy-tale, a tradition and a legend. Memory is song and music. In them we find the people's memory, which widens its banks as it flows from generation to generation. This is where we find the people's wisdom, the blazing torch that is passed from generation to generation. Take it, bear it, pass it on! Add grain to grain and line to line, fruit to fruit and music to music, blossom to blossom and song to song!" The free book uploaded this month: A photo-book published first in November 1956 by Publications Division. This is the second edition that came out in May 1962. Most of the photographs are from around early 1950s. 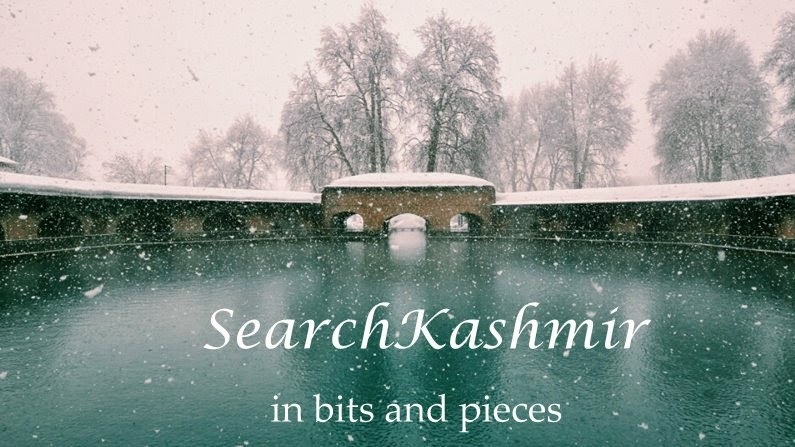 And with that SearchKashmir in now in its 7th year. 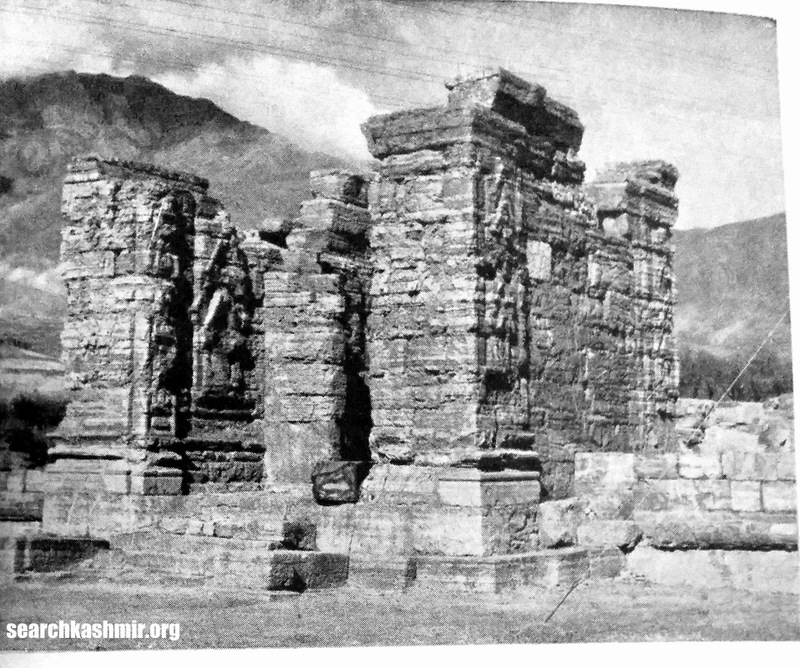 A century ago, when the digging began at Avantipora, people expected to find two temples dedicated to Shiva. 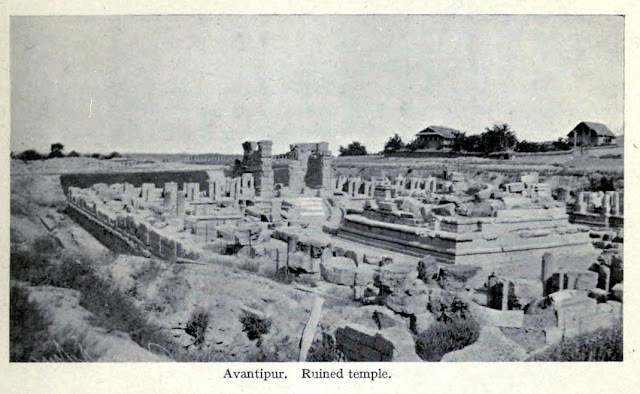 Instead they found one dedicated to Vishnu (Awantiswamin Temple) and the other dedicated to Shiva (Awantisvara Temple). The smaller of the two, Awantiswamin was found to be more stunning while Awantisvara was found to be in a more decrepit state. 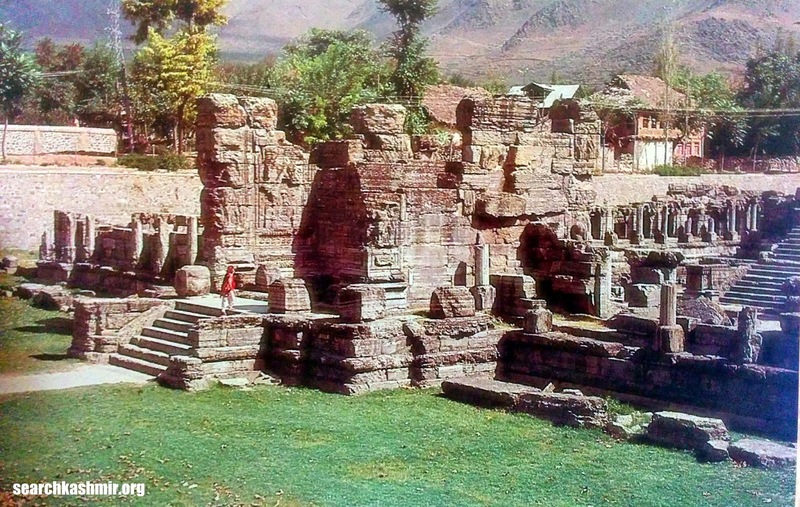 Awantisvara temple is located near the hamlet of Jaubrar about a kilometer to the north-west of the Awantiswamin temple. 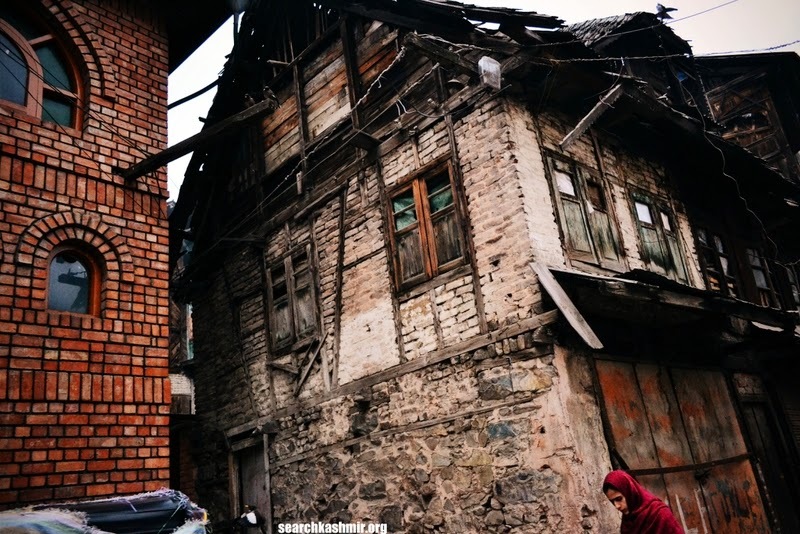 While leaving Srinagar and moving onto Bijbehara, this is the first ruin of Avanitpur. This temple too is believed to have been built by King Avantivarman (AD 855 – 883 AD), the first king of the Utpala dynasty. "Facing the west, the complex consists of a panchayatana temple in the middle of an oblong courtyard, two subsidiary shrines (one each at the north-easter anf south-eastern corners)", a quadrangular array of cells around the periphery of the courtyard and a double chambered imposing gateway in the centre of the western row of cells in two flanks." 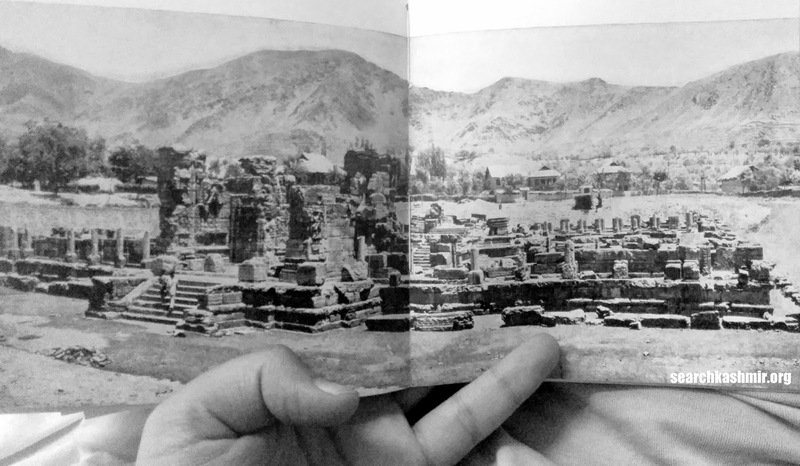 The ruins suggest that the temple was laid to be a immense monument but for unknown reasons the construction was never completed. What would have been a 'ghata- (pot) shaped' pillar. 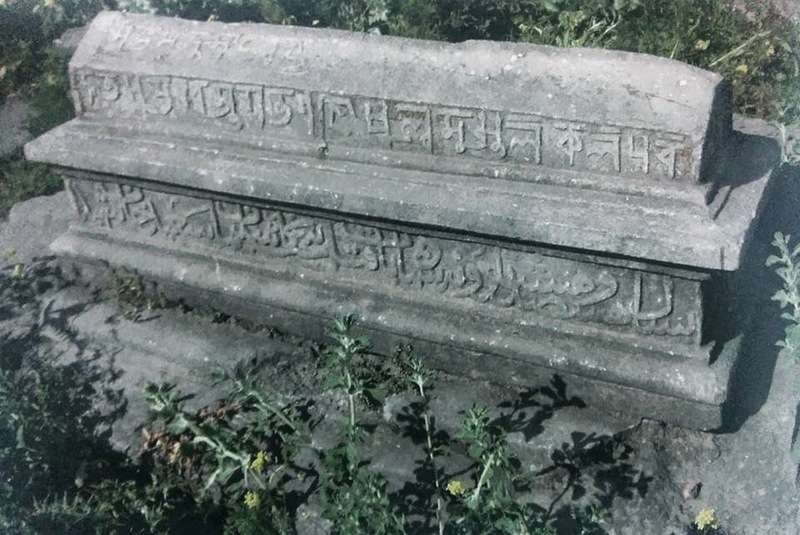 Something not found in design of Awantiswamin temple. "The interior of the central shrine is still covered with a heap of large stones, and it is not yet known if any fragments of the image of Avantisvara-Mahadeva, which was worshipped in this temple, will be found." ~ D. R. Sahni in 1913 after doing the initial digging. 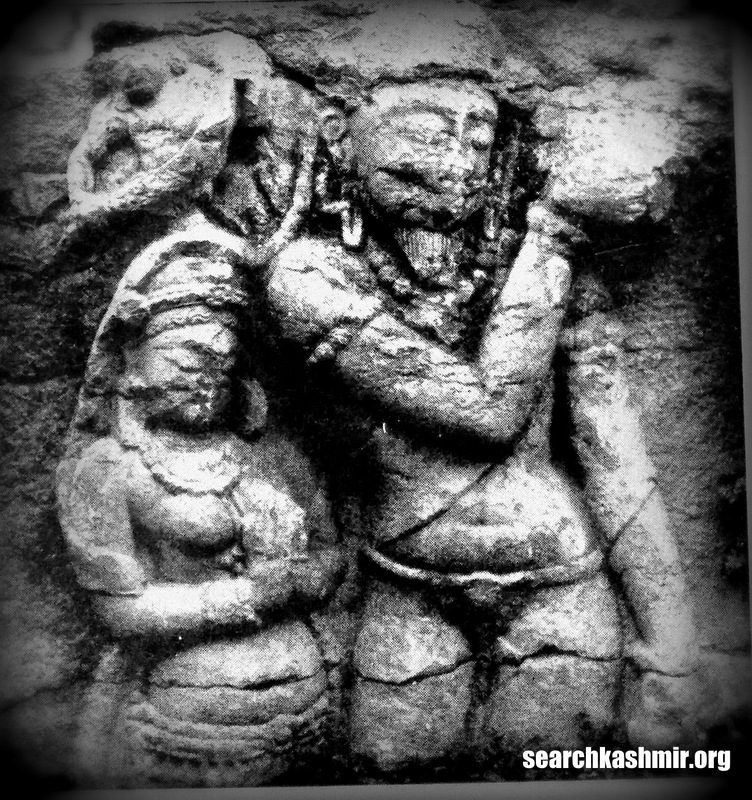 The relief of Avantivarman and his queen. The ground is littered with stones bearing such carving which were meant to be part of the temple. The injury to the stone is definitely recent and man made. From the book 'Pandrethan, Avantipur & Martand' (1977) by Debala Mitra, the carved stone in a more pristine form. Apparently there is something about breasts that makes the modern man very violent. In 2014, Awantiswamin is kept by ASI as site keeping in mind the tourists, there is an office and a ticketing system, while Awantisvara is more like a local public park. It is open for everyone with just a low barrier at the main outside gate designed to keep out the animals. We watch a ruin emerge out of the ground and a city engulf it. 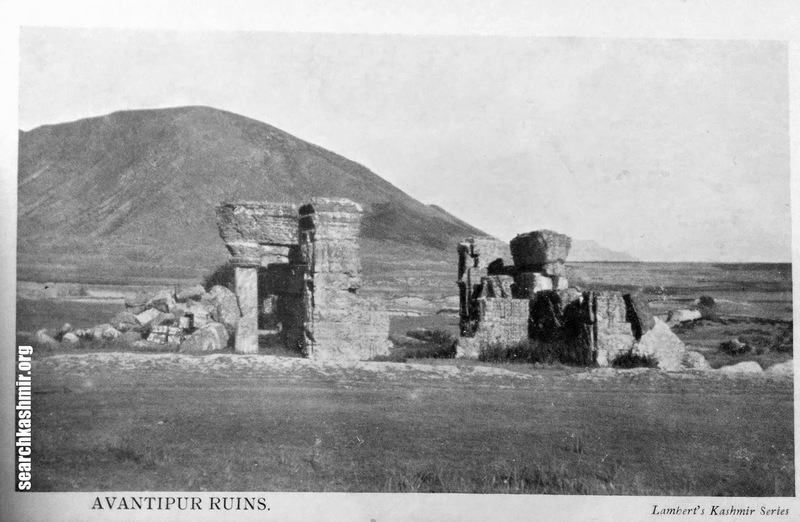 Archaeological Survey of India report, 'Illustrations of Ancient Buildings in Kashmir' (1869). 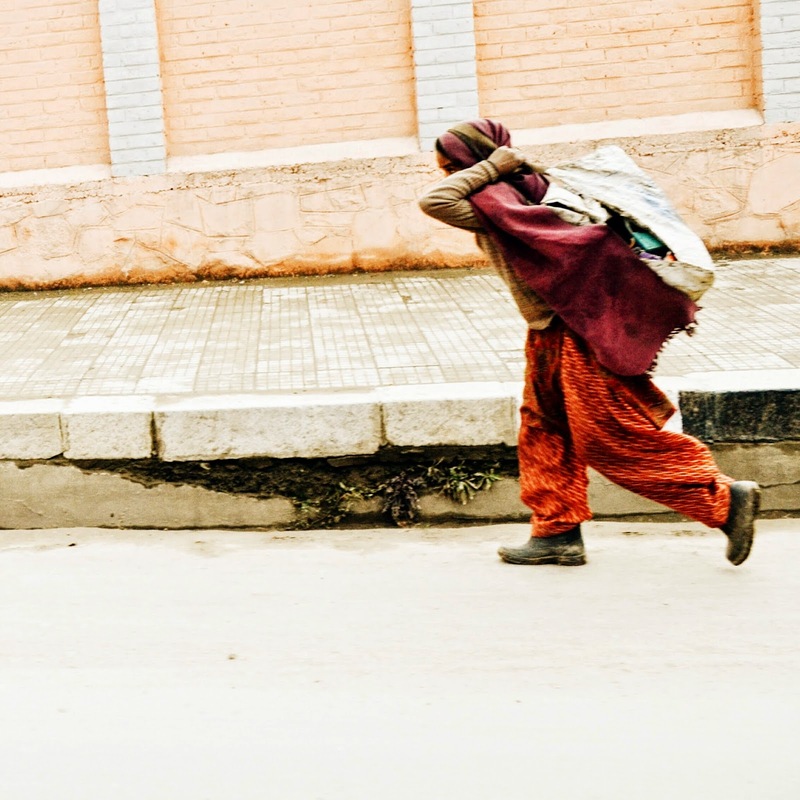 A postcard from Lambert's Kashmir series. 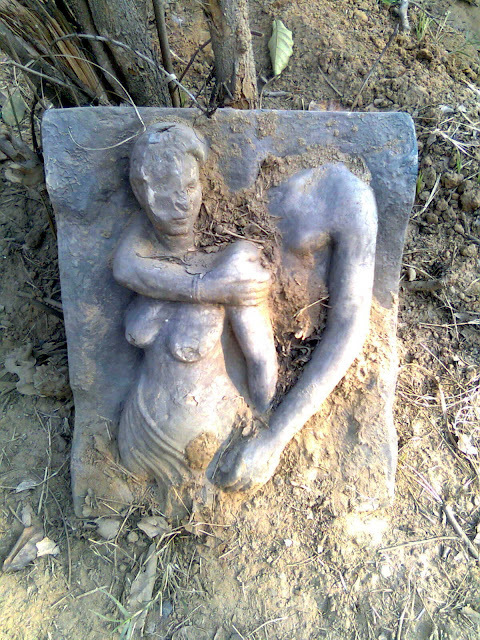 Must be around 1910 when J. C. Chatterji did the primary digging. 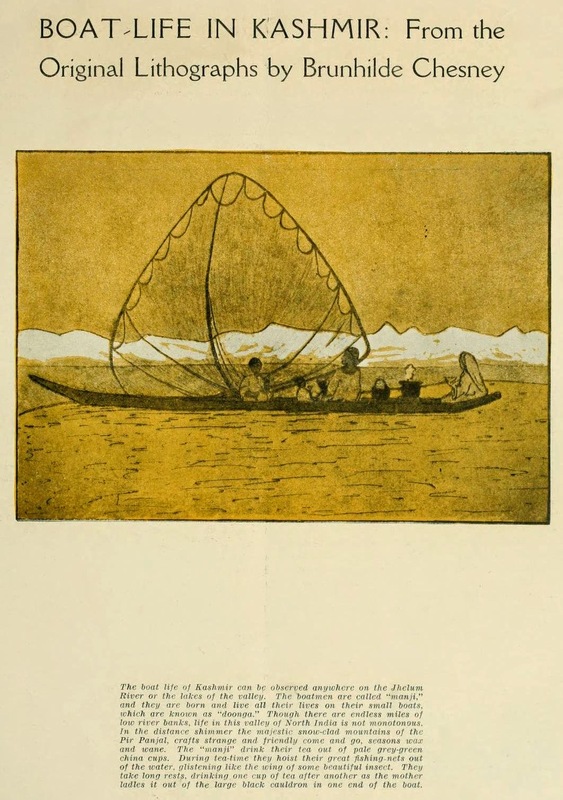 Below: A Photograph from 'Our summer in the vale of Kashmir' (1915) by Frederick Ward Denys.